Raghuram Rajan, the Joseph L. Gidwitz Professor of Finance in the Graduate School of Business, has been awarded the inaugural Fischer Black Prize from the American Finance Association. The prize, modeled along the lines of the Fields Medal in mathematics and the Clark Medal in economics, will be awarded biannually to recognize outstanding contributions to the field of finance by a person under age 40. The prize was established in honor of Fischer Black, who was a co-inventor of the Nobel-prize winning Black-Scholes-Merton options-pricing model. Rajan received the honor while attending the American Finance Associations annual meeting on Jan. 4, in Washington, D.C. In announcing the award in January, George Constantinides, the Leo Melamed Professor of Finance in the GSB and chairman of the prize selection committee, said the committee unanimously chose Rajan. Rajans Ph.D. thesis pointed out the downside to cozy bank-firm relationships long before these became apparent in detailed studies of systems like Japans. His recent theoretical work with Douglas Diamond, the Merton H. Miller Distinguished Service Professor of Finance in the GSB, knits together the microtheory of banking with macroeconomic theory. Their research promotes greater understanding of the role banks play in the provision of liquidity, why this function makes banks so prone to systemic crises, and why changes in monetary policy have such a significant effect on bank lending. Rajans current work with Luigi Zingales, the Robert C. McCormack Professor of Entrepreneurship and Finance in the GSB, details the importance of a good financial system for economic growth. In their forthcoming book, Saving Capitalism from the Capitalists, Rajan and Zingales argue that the reason why so many countries have underdeveloped financial systems despite their undoubted importance is because of the political opposition of elites who fear freeing up access to finance. 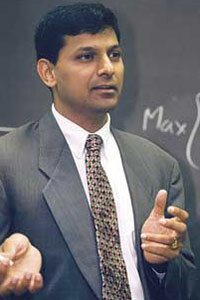 Rajan has been a member of the GSB faculty since 1991. He received a B.Tech in electrical engineering from the Indian Institute of Technology in Delhi in 1985; an M.B.A. from the Indian Institute of Management in Ahmedabad in 1987; and a Ph.D. from the Massachusetts Institute of Technology in 1991.